David says that the inspiration for this first Romance Annual was the enduring nature of love, as swans pair for life. 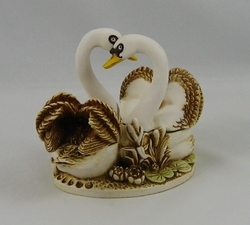 The plumage on each swan lifts up to reveal two hidden compartments, one containing a rose in tribute to Princess Diana, and the other containing a pillow that may be removed to reveal a red heart. David’s acorn is between the leaves on the base. The first 3,660 have swans with red beaks and blue pillows, the next 404 have yellow beaks and blue pillows, and the rest of the edition has yellow beaks and light green pillows. Hallmarks include ©, heart, HBC logo, ed.#, and DL.